The Sennheiser Momentum on-ear headphones - perfectly formed for aural pleasure? 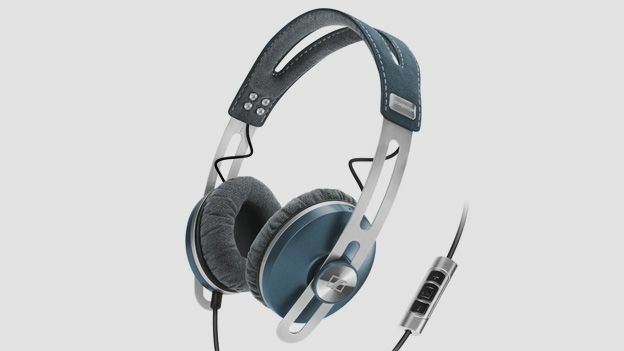 The Sennheiser Momentum on-ear headphones are a smaller version of their big brother cans the Sennheiser Momentum headphones, which caused quite a splash back at CES 2012. Now in a range of cream, pistachio, blue and pink shades to attract fashionistas (and people who dislike black and brown), they're ready to take on all comers - most likely the excellent B&W P3s at the same price point, give or take a tenner. In comparison with some of the stoopid-big over-ears you'll encounter on public transport, these smaller Sennheiser Momentums are a breath of fresh air. They're completely rigid due to the standout design of the headphone band, but although that makes the carry case fairly massive, they're a decent commuter-size compared with their brother cans, the Sennheiser Momentum over ears headphones. The Sennheisers radiate confidence in their build quality. That central brushed stainless steel band and fixing rivets look robust indeed, the ear-cup backs are plastic, but feel solid and reassuring. The on-ear cups are covered with Alacantra, normally used in high-end car seats and dashboards, which gives a velour-like finish that Sennheiser claims is water resistant and more durable than bog-standard velour. Neat touches abound, like the Sennheiser logo on the polished jackplug, the high-quality zips on the carry case, and the additional dust bag. There's a remote with mic, designed for Apple products (yawn) which delivers conversations perfectly well. Overall, they're a quality item, and shouldn't shame you when worn with anything from swimming trunks to a suit. Comfort is superlative, with missile-proof adjustment of the earpiece position on the band and a multi-position rocker at the joint of cup and headband meaning these will conform to any head shape. They stay put during the rigours of tube-moshing well too, unlike some competitors, and sound leakage levels will keep your fellow passengers happy. A decent 1.4m length cable and right-angle jack are both essential ingredients in a commuter can, and the Sennheisers don't disappoint. A cunning bayonet fitting might fool you into thinking that the cable isn't replaceable, but twist and the jobs a good-un. Obviously you'll be buying a genuine Sennheiser replacement cable with that special connector on, but them's the breaks. You'll need an angle grinder to damage the headband, so our money is on these lasting pretty well. First up, these are closed-back cans, so you're not going to get that open backed, home hi-fi fidelity sound. However, they deliver a balanced mix - decent bass without being Monster-silly, and delicate highs. Sennheiser claim this is down to proprietary 18(ohms) transducers, which "ensure full stereo sound with extraordinary rendition of details." 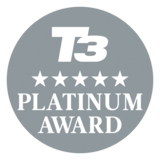 Back to back with the B&W P3s (their obvious competition) the sound stands up well, making the B&Ws sound colder - it's a personal choice in the end, but one you'd be well advised to consider before laying out the cash on either model. Will the Kef M500 headphones sound as good as they look? Do the Philips Fidelio L1 headphones offer enough substance to back up the style?